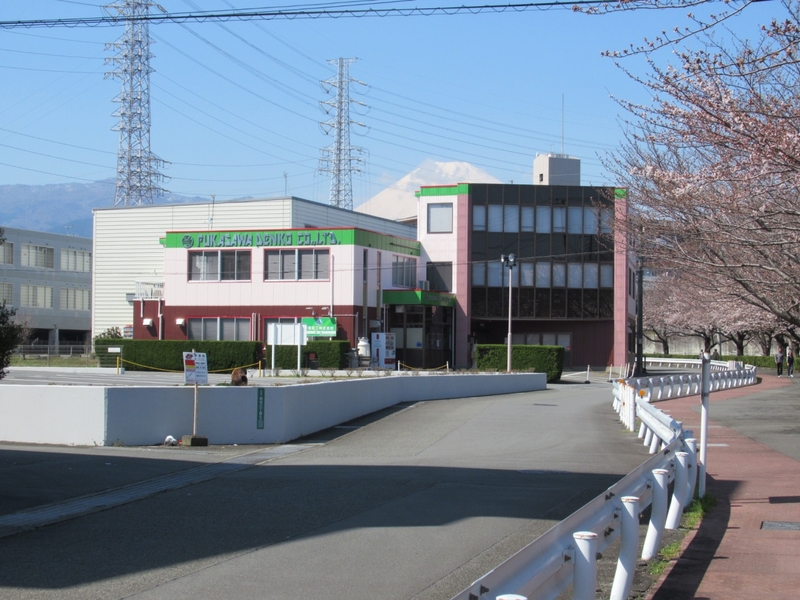 Fukasawa Denko Co., Ltd. (hereafter called FDK) was established over 50 years ago in 1967 in Nagaizumi Town, at the foot of Mt. Fuji. In the early days of its foundation, FDK was mainly engaged in the mass production of electronic control devices and the surface mounting and assembly of printed circuit boards. However, as the world is changing so rapidly, FDK is now shifting its focus on the production of small or variable batches of a wide variety of products, and is striving to establish a production system so that it can quickly respond to current demand. FDK is also expanding its business in other fields such as temporary staffing and analytical instruments. I believe that small and medium-sized businesses such as ours should have at least one remarkable strength in which we are superior to large companies. As for FDK, our cheerful greetings, a neat and tidy work environment, a high level of customer satisfaction are what we excel at the most. In addition, FDK positively employs people with disabilities in many of its sections. They work in collaboration with able-bodied employees and spur each other on toward a common goal and a job well done. FDK is committed to creating equal employment opportunities and a comfortable work environment. We work to ensure that everyone can find pleasure in working at FDK irrespective to impairment and age. Finally, FDK will continue to work hard toward making improvements in its business performance and strive to support of all of its employees and their families. I strongly believe that small and medium-sized businesses such as ours can outshine large industry by possessing and utilizing their unique and special skills and abilities. FDK is an ISO 14001 accredited company. As an earth-friendly company, FDK is committed to contributing to the development of our community, establishing an environmental control system and implementing appropriate measures for environmental conservation through its business activities such as the production of electronic control devices. FDK is an ISO 9001 accredited company. FDK is committed to delivering products of perfect quality and ensuring only the highest level of customer satisfaction. 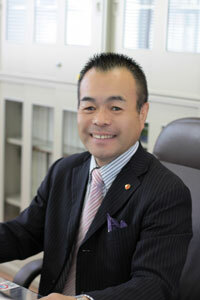 Toshisada Fukasawa, the founder of FDK, personally develops an electronic control panel. 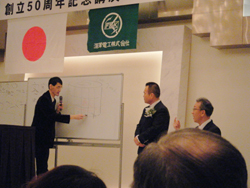 Fukasawa Denko LLC is founded. FDK’s new factory is constructed. 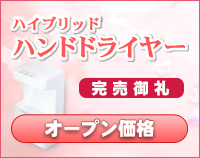 Capital is increased to 5 million yen. Capital is increased to 10 million yen. Fukasawa Denko Ltd. becomes incorporated. A second factory is newly constructed. FDK is commended by the Minister of Labor. The head office and original factory is phased out, and the second factory is registered as a head office. FDK is ISO 9002: 1994 accredited. FDK is licensed to provide a temporary staffing service. FDK is ISO 14001: 2004 accredited. FDK is ISO 9001: 2008 accredited. 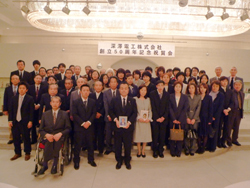 Shizuoka Prefecture approves FDK’s management innovation plan. FDK begins selling a hybrid hand dryer. FDK launches a toilet cleaning service called Angel’s Cleaning. The capital is increased to 20 million yen. 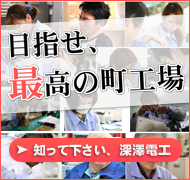 A new factory (Justice Sakurazutsumi) is established. FDK held lectures to commemorate the 50th anniversary of its foundation. Thanks to your help and support, FDK celebrated its 50th year since its foundation. FDK held two lectures to commemorate the 50th anniversary of its foundation. First, FDK invited Mr. Yasuhiro Shiganai to give a lecture titled “Give and Give, and Everything Will Go Well.” Mr. Shiganai is the representative and chief editor of Small Acts of Kindness Campaign to make improve to our world in 10 years. 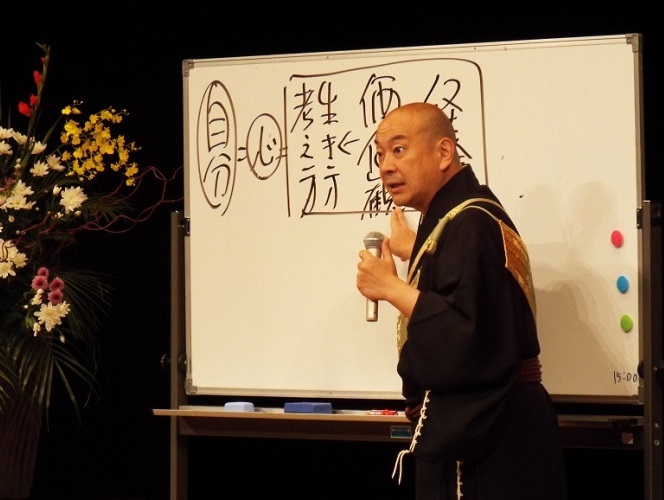 Second, FDK invited Mr. Ohya, who is the steward of Yakushiji Temple, to give a lecture titled “Conditions for Happiness” at Nagaizumi Cultural Center. Thanks to an announcement we gave to neighboring companies about the lecture, 400 people attended in all. FDK will continue to devote itself every day to further developing its strong points: cheerful greetings, a neat and tidy work environment, and the highest level of customer satisfaction. FDK would be most grateful for your continued cooperation and support. An automated external defibrillator (AED) is available. ※FDK appears on the Shizuoka AED Map. If you come by car, it takes approximately 15 minutes from the Susono Interchange or the Numazu Interchange. If you take the Shinkansen bullet train to Mishima, it takes approximately 7 minutes from there by taxi. If you take the JR Gotemba Line to Nagaizumi Nameri, it takes approximately 10 minutes from there on foot. 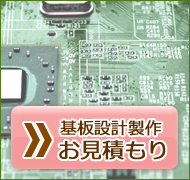 OMRON Corporation PURPOSE Co., Ltd.
Toei Electric Co., Ltd. Toray Medical Co., Ltd.
NSS Ltd. Sun Eight Electronics Co., Ltd.
Koyodenki Corporation Sankei Co., Ltd.
F and F Co., Ltd. Ushio Inc.
SAS・SANWA Co. Ltd. Ronri Kairo Co., Ltd.
Toshin System Circuit Co., Ltd. THAMWAY Corp.
Hayashi Denko Co., Ltd. EARTHTEC Co., Ltd.
Malcom Co. Ltd. Tiger Wing Co., Ltd.
Tokyo Micro Co., Ltd. Hokuto Denko Corp.
Union Tool Co. Sankoumusen Co., Ltd.
Toshin System Product Co., Ltd. Tosei Electronic Control Co., Ltd.
Maruzen Kogyo Co., Ltd. Unitec Co., Ltd.
Hokulea Systems Co., Ltd. Tokai Electronics Co., Ltd. Copyright (C) 深澤電工株式会社 All Rights Reserved.